Ever since the establishment in 1878, H. Clay Glover Company has been a leading manufacturer of over-the-counter anti-dandruff products. As one of the country's oldest pharmaceutical manufacturing companies, Glover has maintained this strong market position by continued products improvement. Early in 1977, the company decided to manufacture its Medicated Ointment for Hair and Scalp in-house. The research group was assigned the task of improving the physical characteristics of the product while minimizing capital expenditures for the necessary manufacturing equipment. 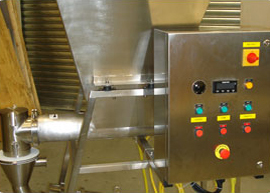 The process requires heating and intensive mixing of one portion of the batch at temperatures between 70 and 75 deg. C. The second portion of the batch needed complete dispersion, without heat degradation, of several fine solids, the most heat sensitive of which is salicylic acid which sublimes at temperatures in excess of 76 deg. C (169 deg. F). The two parts of the batch then could be combined with gentle agitation at temperatures below 60 deg. C (140 deg. F). High shear mixing for the two separate parts was needed. With one part requiring an elevated temperature and the other only room temperature, the procedure appeared to need multiple processing equipment units. 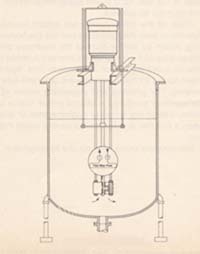 If typical pharmaceutical manufacturing techniques were followed, the company would have to purchase a hemispherical jacketed kettle, steam boiler for heating the kettle, a second non-heated kettle, and agitator plus high shear dispersion device for each kettle and a transfer pump - altogether a major capital equipment expenditure. Also, the multiple mixers, pump and piping would greatly increase clean-up time, thus adding to costs. The process also would create a major increase in energy consumption since four mixer motors, one pump motor and a steam boiler would have to operate at the same time. The management decided to modify the procedure so it could minimize energy consumption, minimize capitol expenditures and maximize the return on its investment. The critical step was the heat-sensitive second part. This segment could be made at room temperature in a small, inexpensive cylinderical tank if a high shear mixer could be found that quickly produced a fine dispersion. If this mixer was easily portable and if it was efficient, it could also be used to prepare the first part. 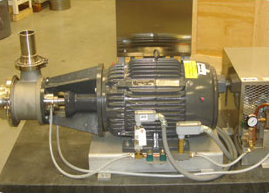 One high shear mixer and one mixer motor would do the job of two. After evaluating numerous mixing and dispersion devices, the ARDE Barinco Reversible Homogenizer was selected. Laboratory trials showed that the double-stator homogenizer was versatile, extremely efficient and easily portable. The equipment purchased for the modified process was a single 125 gallon jacketed hemispherical kettle with anchor agitator, one 5 HP ARDE Barinco reversible homogenizer, a small steam boiler, a portable lifting crane and a 30-gallon non-jacketed cylindrical tank. 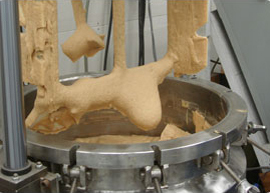 The production sequence is started by melting the petrolatum in the jacketed hemispherical kettle. Bentone gel is added to the hot, fluid petrolatum with rapid agitation to break up the gel. The homogenizer is then suspened by the portable crane and lowered into the kettle. 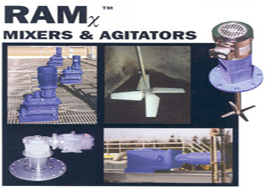 The fluid mass is rapidly and repeatedly pumped through the high shear mixing head toward an adjustable baffle plate. 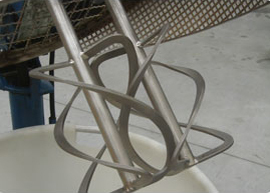 Upon striking the baffle plate, the fluid is forced to the kettle wall where it is swept downward to again enter the zone of the high shear mixing head. After a mere 15 minutes of this umbrella flow high shear mixing, all the gel is thoroughly dispersed in the petrolatum. All lumps and specks have been completely eliminated in the first part. The steam is turned off. 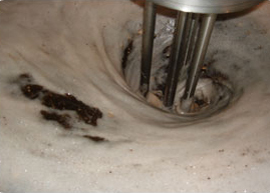 Cooling water is introduced into the kettle jacket with the anchor agitator scraping the kettle walls. The temperature is lowered to 60 deg. C (140 deg. F). As the first part temperature is being lowered, the portable crane raises the reversible homogenizer from the kettle and lowers it into the nearby 30 gallon cylindrical mixing tank. The operator had put in the appropriate quantity of room temperature mineral oil during the high shear mixing of the first part. For the second part, the homogenizer is started in the down-mode to quickly wet minus 325 mesh sulfur powder, salicylic acid power and micronized pigments with the heavy, cold mineral oil. The violent vortex, created when the reversible homogenizer operatures in the down-mode , pulls the fine solids into the mixing head to ensure rapid injection of all the solids into the mineral oil. At the same time, the down-mode is blasting the tank bottom with a high velocity fluid stream. The down thrust sweeps the entire tank bottom so that none of the fine, hard to wet solids settled on the bottom or in the far corners. When all the solids have been added (usually 25 minutes or less), the operator reverses the homogenizing action by simply flipping the reversing switch. The powder and mineral oil mix now is subjected to an intense combination of mechanical and hydraulic shear during 20 minutes of upward umbrella flow dispersion. The grinding and dispersing action of the homogenizer produces a second phase that is completely free of any lumps of agglomerates or specks, when a thin film is subjected to careful visual inspection. The protable crane lifts out the homogenizer. The homogenizer is set aside. Now the crane raises the cylinderical mixing tank with its contents over the kettle. The room temperature dispersion is drained into the kettle where the anchor agitator is stirring the cooled, 60 deg. C (140 deg. F) petrolatum part. This gentle agitation combines the two parts. Additional cooling and continued agitation lowers the batch to room temperature and produces a smooth, creamy ointment. This modified process produces 100 gallons (754 pounds) of ointment in one and a half to two hours. The efficient homogenizer assures consistant product quality. No maintenance has been required even after two years of operation and quality control was perfect. Every pound of ointment made met the high H. Clay Glover quality standards. Only one kettle has to be heated. Only two motors, one for the homogenizer and one for the anchor agitator, have to be operated. Increase in energy consumption was very slight, and energy savings coupled with labor costs of just a single man kept ointment manufacturing costs at an extremely low level. Cost to purchase and install the broiler, kettle, homogenizer, crane and tank were fully recovered after the first year of operation. Six months after the new ointment manufacturing process was initiated, it was obvious that the reversible homogenizer was both versatile and very efficient. 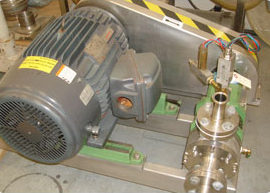 A second such unit was purchased to replace another high shear mixer that had been used for preparing Glover's Mange Medicine. The second homogenizer was permanently installed in an existing mixing tank to make 110 gallon batches of the mange medicine. Minus 315 mesh sulfur and fine, powdered Bentone are dispersed into a petroleum based fluid with the high shear mixer running in the down-mode . In 15 minutes, all the hard to wet solids are introduced into the room temperature petroleum. Then the mixer action is reversed for 25 minutes during which the vigorous mechanical and hydraulic shearing provide complete Bentone dispersion which is essential to uniformly suspend the sulfur. Compared to the previous mixer, the ARDE Barinco unit was able to double the production of the mange suspension by slicing the batch processing time from one and half hours to 40 minutes. In addition, superior shearing action of the reversible homogenizer improved product uniformity by providing more even dispersion of the active ingredients during subsequent processing and packaging.